Lindemann (1942) put forth ten percent law for the transfer of energy from one trophic level to the next. According to the law, during the transfer of organic food from one trophic level to the next, only about ten percent of the organic matter is stored as flesh. The remaining is lost during transfer or broken down in respiration. Plants utilise sun energy for primary production and can store only 10% of the utilised energy as net production available for the herbivores. When the plants are consumed by animal, about 10% of the energy in the food is fixed into animal flesh which is available for next trophic level (carnivores). 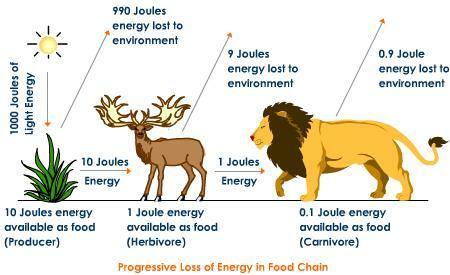 When a carnivore consumes that animal, only about 10% of energy is fixed in its flesh for the higher level. So at each transfer 80 – 90% of potential energy is dissipated as heat (second law of thermodynamics) where only 10 – 20% of energy is available to the next trophic level.